Burnley skipper Tom Heaton has earmarked victory over Rovers at Ewood Park as one of the most memorable highlights of his career to date. 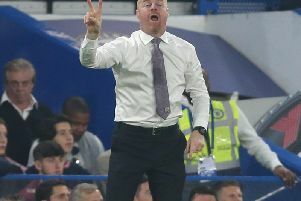 The 29-year-old goalkeeper spoke of his elation after the Clarets ended a winless run against their arch nemesis that had stretched 11 games, over three decades. Jordan Rhodes had given the hosts a first half lead in the fixture in March last year but Sean Dyche’s side hit back through Jason Shackell and striker Danny Ings. “It was a massive moment for me,” he said. “The feeling was incredible when Shackell nods one in and Ingsy scores. It was absolutely brilliant. “It was a fantastic atmosphere and it’s a great place to go and win after 30-odd years. It was top drawer. “We want more of that and it’s certainly the aim. “It was brilliant and the sort of game that you want to be involved in. “The first one that I played in here was good for me. “The atmosphere was incredible and I thoroughly enjoyed it. The England international, who has earned three successive call ups to Roy Hodgson’s Three Lions squad, will wear the captain’s armband for the East Lancashire derby tomorrow having taken on the mantel from departed defender Shackell. And it’s a responsibility and opportunity that he’s relishing. “It’s a massive moment and I’m looking forward to it,” said Heaton. “I’ll be delighted. There’s pressure in every football match, every time you step out on to the pitch. “It just depends on your mentality - I just try and enjoy it and give everything I’ve got. “There’s a lot of excitement going in to it. We’re looking forward to it. “While it’s a brilliant occasion and it means a massive amount to the players, we’ve still got to make sure that we put a performance in to give ourselves a chance of winning the game. Heaton, who has kept three clean sheets this term, added: “If you’ve got XI players doing that in the team, given the ability that we’ve got and the fitness levels, then we’ll give ourselves a great chance of winning. “You can never guarantee anything in football, I’ve learnt that over the years, but you can keep getting better, working hard, give everything you’ve got and see where that takes you.